Google Tasks is a light weight TODO list managing application built right inside GMail. 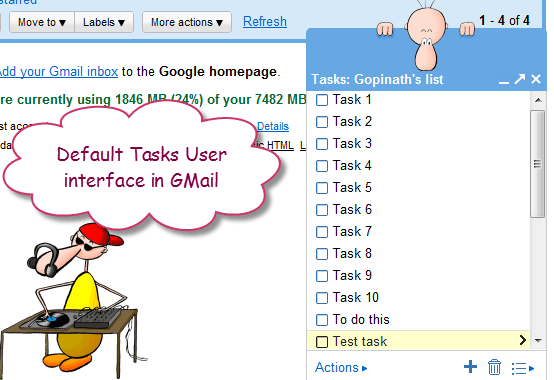 It’s simple user interface and nice integration with GMail system makes it very easy to track the tasks we need to do. Even though there are very popular and powerful websites dedicated to manage TODO lists, being integrated with GMail makes Google Task as my favourite. The default user interface of Tasks provided by GMail is similar to a chat window that popup at the bottom right corner of GMail window. I find it more comfortable to have Tasks in the side bar rather than as a popup window in the right side bottom of the screen. What do you say? If you are using a mobile browser, just go to gmail.com/tasks to have a customized views for your mobile. Especially iPhone and Android guys get better user interface options.